Baseball and softball fields are unique playing surfaces. In “hard-surface” sports (volleyball, basketball, tennis) the game is played on firm, solid materials which aren’t readily eroded even when they are outdoors (Fig. 1). Other outdoor sports (soccer, football, lacrosse) are played on grass. 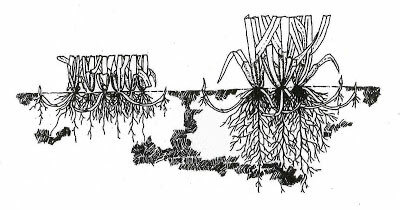 The roots of the grass stabilize the soil much like rebar or wire mesh helps to stabilize concrete. The green tissue above the ground also shields the soil from erosion by water and wind. On a baseball or softball field, there is no vegetation to protect the soil from being displaced by the elements or by players’ cleats. While this seems obvious, we’ll discuss below why it’s an important concept in field construction and maintenance. Figure 1. 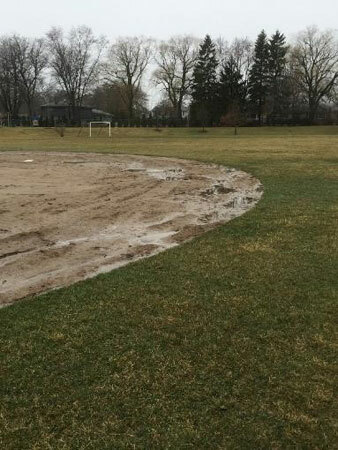 Baseball and softball fields are more susceptible to erosion than other sports surfaces, which are either impermeable or covered with turfgrass. At H&K Sports Fields we constantly preach the importance of a proper “grade” (slope) on an infield. It doesn’t take much: we grade infields at 1% slope or less- but having a slope to the field ensures that excess water will exit the skin thanks to gravity. Unfortunately Mother Nature doesn’t want soil to be placed this way! After a field is built, normal use tends to displace material in the high-traffic areas. In addition, the elements act on an infield 24 hours a day, 365 days a year- slowly but surely carrying soil away with the wind and the rain. Without grass or other vegetation to protect the soil, the crown wears away until the higher areas are leveled and the entire surface becomes relatively flat- with the exception of low-lying depressions which form around the bases and other high-traffic areas. This is particularly true on totally-skinned infields because the high point of the field has no grass on it. In geology, surface topography which has been worn flat is called a peneplain (Fig. 2, left). I have observed very degraded softball fields where the entire field is within 1.5” of level (minus the aforementioned wear areas, which quickly fill with standing water). 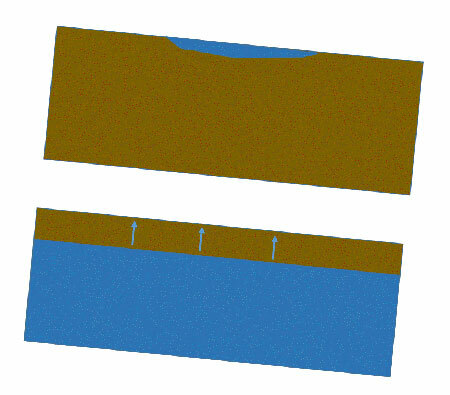 Without a crown or other slope, water can sit in the low spots for days (Fig. 2, right). Geologically speaking, the soil erosion happens quickly- within just a few years. But in our normal concept of time this is still slow and occurs too gradually to notice with the naked eye. This gradual removal of material means when it comes time to re-grade, new infield soil must be added to replace what was lost since the previous renovation. Figure 2. Left: A landscape-scale “peneplain,” showing relatively flat topography with lakes and ponds. Right: A skinned softball field on which the positive surface grade which has worn away, leaving a nearly flat surface with low spots in the high-traffic areas. The physical makeup of an infield soil is a hefty topic- one which warrants its own article. However it is worth mentioning that the percentages of sand, silt, and clay in the mix certainly affect the longevity of an infield’s grade. Fields with too much sand and too little cohesive clay tend to erode mostly via rainfall- meaning lip buildup will be especially serious on these fields. Infields with too much silt tend to become very dusty. Silt is lighter than sand, so it can be carried far away by the wind and completely disappears from the field. After a few years, high-silt fields are usually very low and require quite a bit of imported material to correct the grade. An infield topdressing provides several benefits, one of which is slowing degradation of the infield crown. The individual particles of a topdressing material are larger and heavier than those of infield soil, so it takes more energy from a gust of wind or a raindrop to move them around. During heavy rainstorms, the topdressing helps to shield the infield from raindrop impacts and prevents the base soil from washing away. The topdressing material may still move to some degree; however because it is loose and free-flowing it can easily be re-distributed with a screen drag or level board. Figure 3. 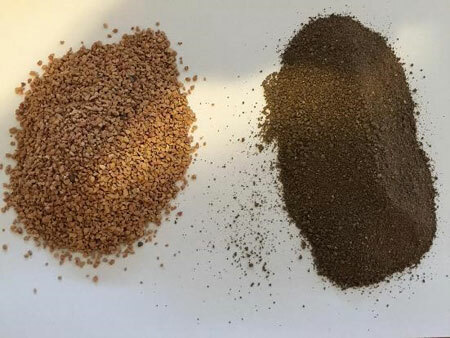 Typical infield topdressing material (left) is much coarser material than infield soil (right). The larger particles are less susceptible to erosion than fine-textured soil. A dense stand of grass is one of the world’s best erosion controls. Turfgrass is planted along agricultural fields, riparian buffer areas, and urban landscapes to reduce the loss of nutrients and sediment. Unfortunately for baseball field managers, the ability of grass to slow runoff and trap sediment is also the source of our biggest headache- lip buildup. As water flows across the infield, it carries with it small amounts of infield soil and topdressing. When the water reaches the grass, it loses some of its kinetic energy. As the water slows down, it can no longer carry the sediment with it, so the soil drops out of suspension and into the turf canopy. Over time, the soil builds up and creates a mounded ridge or “lip” which prevents water from flowing off the skin and into the grass. On fields which receive little maintenance, I have seen lips as large as 8” tall and 10 ft wide! Lip buildup will occur on every field that has a positive surface grade, so regular edging is an important maintenance practice. Improper dragging procedures are another common cause of lip buildup, so be sure to stay at least 12 inches away from all turf edges when dragging. Although we intentionally build baseball and softball fields with a minor slope, the forces of nature slowly erode the crown unless the field is highly maintained. Grass is a highly efficient sediment trap, meaning lip buildup is inevitable without both proper dragging procedures and periodic edging. The use of infield topdressing can help preserve the integrity of the grade along the base infield mix by shielding it from the elements. The topdressing layer also creates a buffer between the players’ cleats and the soil below. A baseball or softball field is a dynamic surface! Understanding the natural forces which act on our fields helps us understand how to build, renovate, and maintain better infields. For more information on infield soils and topdressings, contact H&K’s Evan Mascitti at evan@HKSportsFields.com. Nothing says “baseball season” like a sward of lush, green grass! For many schools and parks, a baseball or softball field sporting dense, uniform turf seems more of a lofty fantasy than a realistic goal. In fact, this dream is not as far-fetched as most believe. In this article, we’ll examine the number one “bang-for-your-buck” practice in turf management: fertilization. 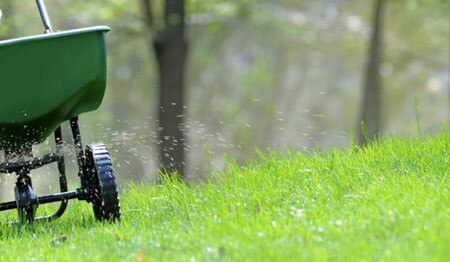 Applying fertilizer is often referred to as “feeding” the grass. In fact, the grass doesn’t need to be “fed” – plants make their own food through photosynthesis – but by adding the proper nutrients to the soil, we can help the grass produce sugars more effectively. The three major nutrients included in fertilizers are nitrogen, phosphorous, and potassium. These elements are typically abbreviated as N, P, and K.
Figure 1. A huge improvement in the quality of most athletic fields can be gained simply by applying enough fertilizer. Most soils in the Midwest were previously used for agriculture, and still contain an abundant supply of P and K. This is fortunate for turf managers, because in many cases we do not need to add any P or K to the soil. In fact it is illegal in Wisconsin to apply P unless you have a soil test demonstrating low levels. The best way to determine how much P and K fertilizer to apply is with a laboratory soil test. These tests are inexpensive (~ $10) and are available through UW Extension or many private labs. H&K Sports Fields can also help you submit and interpret a soil test. Figure 2. 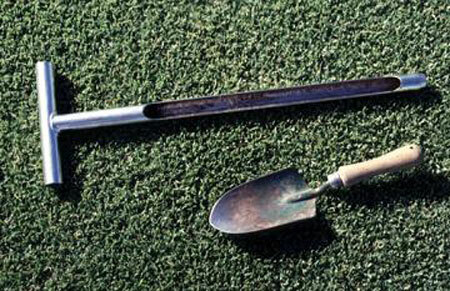 A soil probe is the best tool for taking samples, but a trowel or spade will also work. Keep the sampling depth consistent and take 10-12 samples per acre; after mixing these plugs together, submit a composite sample to your lab of choice. Nitrogen is very different from P and K. Unlike phosphorous and potassium, N does not remain in the soil but is quickly consumed by plants and soil microbes. Grass plants require more N than most broadleaf weeds so unless we add fertilizer the desirable grasses can be overtaken by dandelions, clover, and plantains. So applying nitrogen benefits the grass, but how much should we add? Research by UW Madison turfgrass scientists shows that grass growth peaks at an annual rate of 12 pounds of nitrogen per 1,000 square feet. This is an extraordinary amount of fertilizer!! Fortunately, our goal as turf managers isn’t to maximize growth- it’s to provide a uniform playing surface with good visual appeal. So unless you want to mow your field every day (or twice a day!) please don’t apply this much N. For baseball and softball fields in Wisconsin a good starting point is approximately 4 pounds of nitrogen per thousand square feet each year. This rate is sufficient to encourage vigorous growth and a lush green color without requiring excessive mowing. Unless you are using a slow-release N source, the applications should be made at no more than 1 pound of N per 1,000 square feet at a time. What’s the best kind of fertilizer to buy for your field? That depends on the individual scenario, but it’s best to keep things simple. The grass doesn’t know whether a fertilizer comes in a fancy, bright-colored package, nor does the grass care whether the fertilizer has proprietary formulations and complicated additives. Many agricultural grade fertilizers are perfectly sufficient for fertilizing turfgrass. 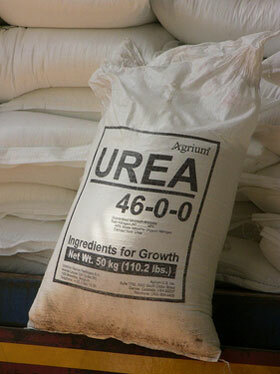 Urea, ammonium sulfate, and potassium nitrate are examples of cheap, effective N sources. When used sensibly, these products produce an excellent turf response and pose little environmental hazard. Perhaps 90% of recreational facilities are not supplying enough nitrogen to their turf. This really can’t be stressed enough! Figure 3. Simple types of fertilizer are usually sufficient for turfgrass – urea and ammonium sulfate are two excellent sources of nitrogen, although they must be applied carefully and watered in to avoid burning the turf. Fertilization (especially with nitrogen) is the cheapest way to make your field stand out visually, and to produce a safer, more uniform playing surface. In future editions of the H&K Maintenance Minute, we’ll examine other simple turf management tips to help your field sparkle! For more information on developing a fertilization program for your own facility, contact H&K’s Evan Mascitti at evan@HKSportsFields.com. In parts 1 (link) and 2 (link) of our drainage series, we discussed getting water off the field and through the profile. In part 3 we’ll talk about getting water away from the field once it’s removed from the surface. A common strategy is the installation of a drainage system. First, a reminder that installed drainage systems are not a solution for a wet infield skin – to address this issue, install a quality soil material and establish a positive surface grade. See Part 1 of the Maintenance Minute drainage series for more information about wet infields. This article will focus on installed drain systems for soil-based, natural grass portions of sports fields. The first question to ask is whether the wet conditions are due to surface water or to subsurface water. As discussed in the two previous articles, excess surface water (i.e. rainfall) must exit the field via a positive surface grade. Only then can installed drains be considered as a possible upgrade. However if the drainage issue stems from the presence of subsurface water (i.e. high water table), the installation of closely spaced drain lines may help lower the saturated zone. This practice has been used by farmers for over 100 years to make otherwise wet land suitable for cultivation. An easy way to differentiate between surface and subsurface drainage issues is to dig a test pit 1-2 feet deep. If the surface is dry but the hole fills with water within 24 hours, you probably have a subsurface water problem. Figure 1. The top profile shows poor surface drainage due to a low spot, while the bottom profile shows a drainage problem caused by a high water table and capillary rise. Even when a field is crowned correctly and is devoid of a high water table, it may remain wet after heavy rain. Often the soggy conditions persist because “heavy clay” soil is present and retains too much moisture (this is why we call it heavy clay; when dry, clay is actually lighter than sand). In this case a system of interceptor drains can be installed to expedite the drainage process. These drains still rely on a proper surface grade to feed them, but minimize the distance water must flow across the surface before being removed. A drop of water falling on the center of the field now must only travel 25-30 feet before it can infiltrate downward, rather than the 160 feet which would be required if the crown were the only means of removing water from the surface. Figure 2. The top diagram shows the distance water must flow on a crowned field without installed drains. The bottom diagram shows shorter arrows, indicating the lesser distance water must flow across the surface before it percolates into a drainage trench. Both systems rely on a surface crown to move water- either totally off the field or into the drains. Trenches are cut at an oblique angle to the surface grade and a perforated pipe is laid at the bottom. The trench is then filled with coarse sand. It is critical that the coarse material is backfilled all the way to the surface! By far the most common mistake with these installations is covering the trench with a layer of native soil. The soil will limit downward movement of water and will create a “perched” water table above the trench. This area will remain soggy even after the field has drained to field capacity. Contrary to popular belief, the grass does not need this soil layer to grow. In fact, the grass atop the sand is normally the healthiest turf on the whole field, due to the improved oxygen content of the rootzone. Figure 3. The top diagram shows a properly designed interceptor drain, with the coarse sand filled all the way to the surface. Water flowing across the surface infiltrates rapidly into the trench and is carried away by the perforated pipe. 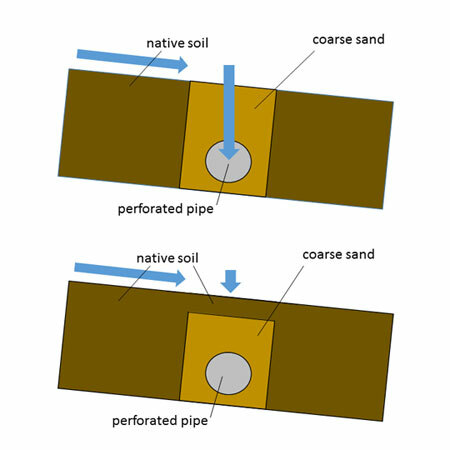 The bottom diagram shows an incorrect installation where soil has been placed above the drain – water cannot percolate through the fine-textured soil and the drainage system provides little benefit. Installed drain systems are not the answer for every field. Maintenance costs for fields with installed drain lines are higher – aerification plugs must be harvested and the field must be topdressed with sand to prevent clogging of the trenches. If these practices are ignored, the drain system will fail within a few years. In addition, installing drainage lines as a “band-aid” fix without first re-establishing a proper surface crown will not prevent water from collecting in low areas. Before the installation all materials used as trench fill should be evaluated by a soil testing laboratory. Check out other editions of the H&K Maintenance Minute for tips on turf management and ways to keep your fields in great shape! Contact Evan Mascitti at evan@HKSportsFields.com for more information on correcting drainage issues with your field. Most of us have performed the familiar task of mowing grass. Perhaps we view it as a boring chore, or maybe we actually enjoy the task of keeping the stripes straight and giving the turf a clean, crisp appearance. Although mowing seems like a simple enough task, there’s more to the picture than “making tall grass short!” Proper mowing is the most important practice to keep your field performing at its highest level. Figure 1: Proper mowing practices go a long way to making your field the best it can be. 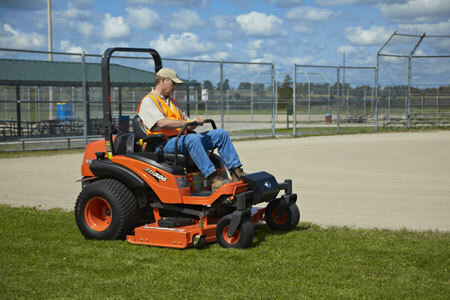 Sports field managers spend a lot of time mowing their fields- more time, in fact, than they spend on any other maintenance practice. In this edition of the Maintenance Minute, we’ll examine mowing more closely – how the grass responds to being cut, the benefits of mowing more often, and simple tips to maximize your time on the mower. Let’s start by thinking about why we mow. As mentioned above, the most inherent reason is to keep the grass short, since it grows back after each mowing. This regrowth is fairly unique to grasses- most other plant species die if they are mowed over and over. In fact, frequent mowing at the correct height is THE BEST weed control method there is! Our next point of discussion is cutting height. The height of cut is dictated by the sport being played- for example, shorter grass is needed for proper ball roll in baseball, but in football the grass can be taller since ball roll isn’t a concern. In Wisconsin, athletic fields should be mowed at heights between 1.5 and 3 inches. Taller grass has more leaf area to withstand the wear from field usage, while also shading the soil to conserve moisture and suppress weed growth. Tall grass also produces more roots, helping it to reach water deep in the soil during periods of drought. The diagram below shows the rooting depths of closely mown turf (left) and a taller turf (right). 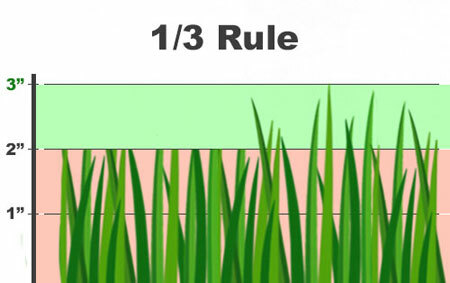 Figure 2: Maintaining your field at a taller cutting height will help the turfgrass grow more roots and withstand the stresses imposed by drought and field usage. While mowing the field is simple enough for us, the turfgrass plants actually have an elaborate response to this practice. Mowing produces chemical signals in the grass, alerting the stems to quickly replace what was lost. 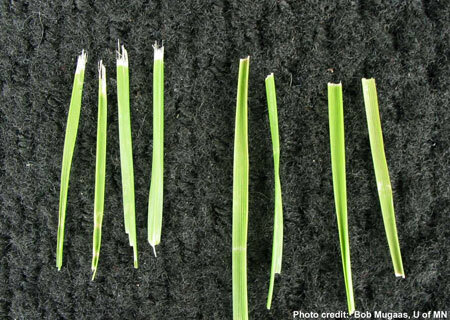 The plants accomplish this by growing new leaves, but more importantly by producing new lateral shoots called tillers. Tillers help the grass spread and fill in damaged areas. It’s a simple equation: the more often you mow, the denser your turf will be. 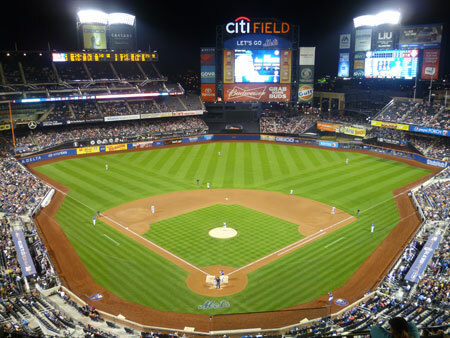 A great example of this practice is on professional baseball fields, which tend to have very dense turf – in large part because they are mowed almost every day. Figure 3: While professional baseball fields receive many inputs, near-daily mowing is among the most beneficial practices performed by these fields’ managers. How frequently should you mow? It would be great to mow 4-5 times a week, but this just isn’t practical for most facilities. At the very least, follow the “1/3 rule:” Never remove more than 1/3 of the leaf tissue at a given time. For example, grass maintained at a 2 inch mowing height would need to be mowed as soon as it reaches 3 inches (preferably sooner). Mowing twice a week is a good starting point in order to follow this rule. Remember, the green leaf blades are a grass plant´s “food factory” so the more green tissue we remove, the more stressful it is to the grass. When most of the green is suddenly removed, the turf goes into shock. Root growth will stop within 24 hours and grass then puts all its energy into replacing the leaf tissue that was lost. It may take several days – or even weeks – for the roots to begin growing again. Weak roots lead to lesser tolerance for drought and other stresses. Figure 4: Removing no more than a third of the leaf tissue when mowing produces a healthier turfgrass plant. The three best ways to improve your mowing techniques are (1) choose the correct mowing height (2) mow more often, and (2) sharpen your blades more frequently. If you only mow your field once every 7-10 days, you will be amazed at how much better your grass will look by mowing 2-3 times per week! While this might be a scheduling challenge, try it for a couple months and you’ll be impressed with the results. The same goes for sharp blades- the whitish, frayed appearance of turf can usually be eliminated simply by running the blade over a file or a grinding wheel. Some turf managers sharpen their blades as often as every day. 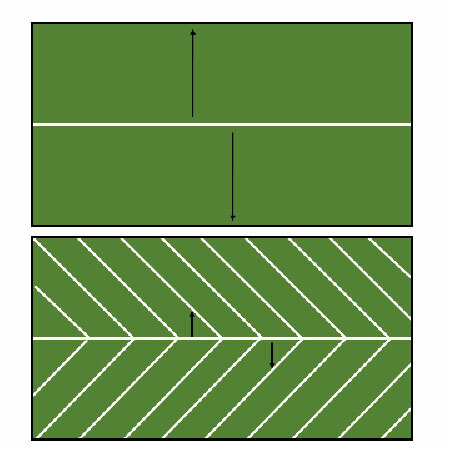 Figure 5: Grass plants mowed with dull blades (left) and sharp blades (right). Mowing is a time-consuming task, but its importance cannot be overstated! Mow frequently with sharp blades to maximize the quality of your turf. For more turf maintenance tips, stay tuned for future editions of the H&K Maintenance Minute, or contact Evan Mascitti at evan@HKSportsFields.com.